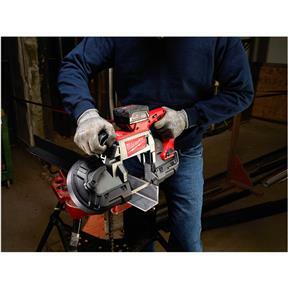 The M18 FUEL™ Band Saw cuts faster than its corded counterparts, provides the same legendary durability of a Milwaukee corded band saw and delivers up to 2X more run time than other cordless options. Utilizing a POWERSTATE™ Brushless motor and Constant Power Technology™, the M18 FUEL™ Deep Cut Band Saw cuts faster than corded band saws. 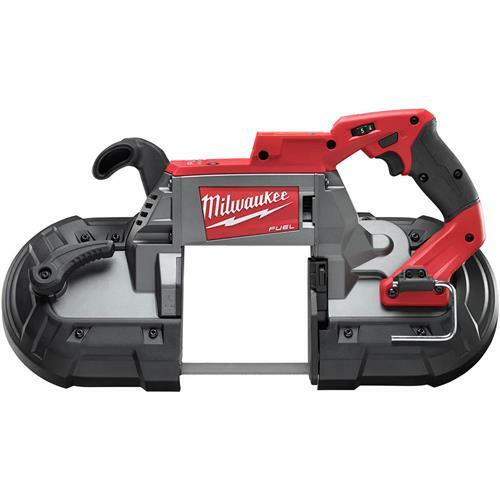 It also delivers the same legendary durability that has made Milwaukee Corded Deep Cut Band Saws second to none for decades by utilizing over 90% of the same parts. Equipped with Jobsite Armor Technology™, the tool is better protected from drops and debris with a proprietary composite material and crush zone barriers to absorb impacts. REDLITHIUM™ XC5.0 Battery Technology provides up to 2.5X more run-time through superior pack construction, electronics, and more work per charge over the life of the battery than any competitive lithium-ion battery on the market. 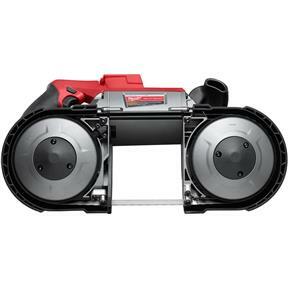 REDLINK PLUS™ Intelligence has the most advanced system of cordless power tool electronics, providing optimized performance, electronic clutch, and overload protection using total system communication between tool, battery and charger. The M18 FUEL™ Deep Cut Band Saw features a tool-free locking adjustable shoe that can adjust from an extended shoe to no shoe in seconds. Other innovative features include a hang hook for easy storage in-between cuts, LED light to illuminate the cutting area, superior cut visibility, and a balanced body design that allows the tool to rest naturally and comfortably in the user’s hands.